Deric's MindBlog: Parallel brain systems regulate our pain. Parallel brain systems regulate our pain. Cognitive self-regulation can strongly modulate pain and emotion. However, it is unclear whether self-regulation primarily influences primary nociceptive and affective processes or evaluative ones. In this study, participants engaged in self-regulation to increase or decrease pain while experiencing multiple levels of painful heat during functional magnetic resonance imaging (fMRI) imaging. Both heat intensity and self-regulation strongly influenced reported pain, but they did so via two distinct brain pathways. The effects of stimulus intensity were mediated by the neurologic pain signature (NPS), an a priori distributed brain network shown to predict physical pain with over 90% sensitivity and specificity across four studies. 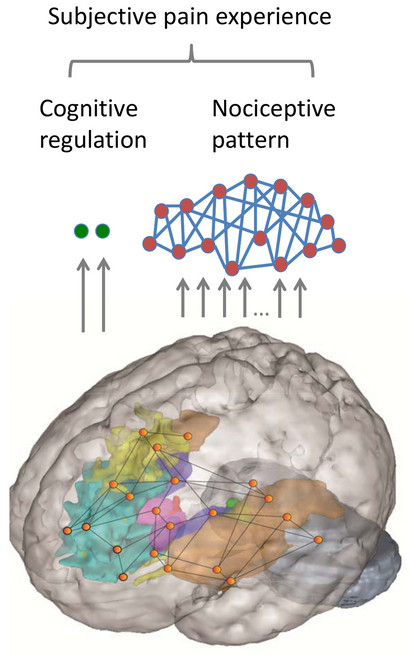 Self-regulation did not influence NPS responses; instead, its effects were mediated through functional connections between the nucleus accumbens and ventromedial prefrontal cortex. This pathway was unresponsive to noxious input, and has been broadly implicated in valuation, emotional appraisal, and functional outcomes in pain and other types of affective processes. These findings provide evidence that pain reports are associated with two dissociable functional systems: nociceptive/affective aspects mediated by the NPS, and evaluative/functional aspects mediated by a fronto-striatal system. Distinct component to the subjective perception of pain. Core nociceptive nodes comprise a multivariate pattern (the neurological pain signature [NPS]), and fronto-striatal brain regions comprise an evaluative pathway sensitive to self-directed cognitive modulation. Subjective status shapes political preferences. We can see in the infrared! Steven Pinker's "Sense of Style"
Watching brain oscillations drive perception. Personality and immune system reactivity.